Mark McGhee had left to lead the Dons to greatness (well, ninth place) and we were down to the bare bones. By the time the season got going in earnest we were without Malcolm, McLean, Smith, Hughes, Sheridan, Clarkson and Quinn. We had, at best, a dozen first team possibles and a newly laid pitch forcing a removal to Airdrie’s ground for the European ties. 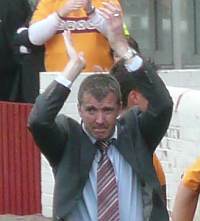 Jim Gannon was a surprise appointment but armed with rave reviews from Stockport fans he was welcomed to Fir Park. We stuttered with Llannelli and scored eight against Flamurtari. By the third qualifying round we had Ruddy in goal and Gannon’s imprint on the team. He talked a good game and produced a fine start to the Scottish season with and eight match unbeaten run. 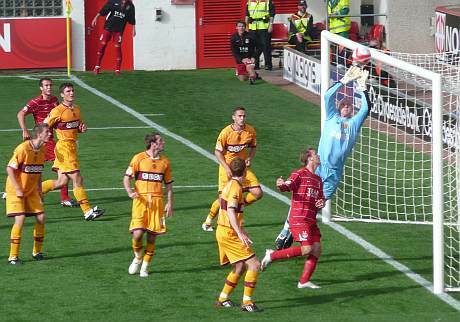 The opening SPL game produced a draw in Perth, the highlight was a stunning goal from Forbes. The first home game, on a perfect pitch, delivered the first instalment of a clean sweep over Kilmarnock and by game five we were fourth in the table. We were getting noticed. A young team and a firm injunction against the ‘long ball’ made for an interesting autumn. The keeper and the back four seemed to hold the ball for ages, making lots of passes and no progress into the opposition half. We shared a 0-0 at Pittodrie and earned some bad publicity for delivering some over the top abuse at Mark McGhee. Inverness were beaten in the League Cup but we needed an extra time goal to win the tie. They were to get revenge in January when they ended our cup hopes at the first hurdle. By the end of the first cycle we had lost only one game, a 3-1 reverse to Hibs. We had developed an inability to press home the advantage when facing ten opponents and the manager had all but banished Craigan, Lasley and Sutton. Hints of unrest in started to leak from the club. We began to find that opposing teams were adapting their styles to counter our passing style. They began to press our defence and prevent our slow build up from the back. We started to look uncomfortable and the early rhythm faded. We salvaged a point in Paisley with what was to become a characteristic late comeback before losing at the same ground three days later in the League Cup. We celebrated a win over Hearts at Halloween but then embarked on a terrible slide. Three draws were followed by five defeats and the end of Gannon. His spats with the media, the public spat with Hugh Dallas, the loss of the dressing room and the inability to maintain sensible working relations with the board and backroom staff caused John Boyle to act. A 6-1 drubbing at Ibrox followed by a home loss to St Johnstone on Boxing Day heralded the end of the Gannon era. His short spell started brightly but ended in acrimony. He legacy was that his loan signings provided a sound basis for improvement. The appointment of Craig Brown and Archie Knox on a temporary basis raised more than a few eyebrows and we’ll follow their progress in part two of the review.